Photographer(s) Appreciation: Thank you to Martin Hieslmair and Ars Electronica@Flickr for sharing the photo. Dianthus caryophyllus, the wild progenitor of many (all?) cut flower carnations, produces a pink flower. Careful breeding has yielded cultivated varieties of bright white, red, yellow and even green carnations. These colours, although not exhibited in wild, represent part of the natural carnation palette, which is dictated by two pigment types: the carotenoids and the flavonoids. The carotenoids provide yellow and orange pigments. The flavonoids are water-soluble pigments, and they can be broken down into three types: the cyanidins that yield red and magenta carnations, the pelargonidins that give us orange, pink, and red carnations, and the delphinidins, which, in theory, would produce blue or purple carnations, if carnations had any. 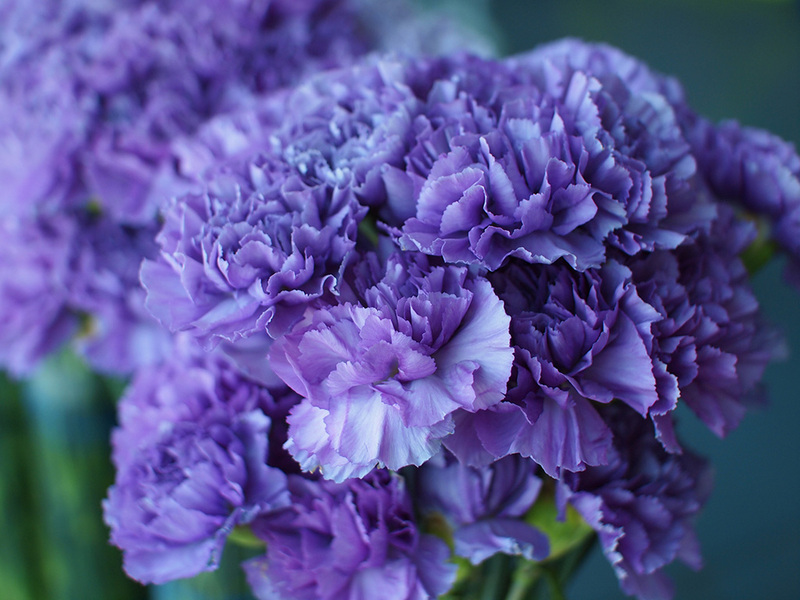 Since carnations lack delphinidins, no amount of traditional breeding will result in purple or blue varieties. The floral trade has overcome this limitation by simply immersing freshly-cut carnation stems in tubs of blue dye. White carnations are easily dyed, and dying carnations is a great science experiment to teach about capillary action. Roses also lack delphinidins, and are occasionally dyed blue in the same way. Recently, geneticists have accomplished what breeders could not; the flower company Florigene® has genetically-engineered a series of purple carnations by implanting a carnation with a delphinidin-containing petunia gene. Florigene’s ‘Moondust’ carnation was introduced to limited commercial markets in 1996, becoming the first genetically-modified flower to be available commercially. These purple carnations do not carry the magnitude of health and environmental concerns as many other genetically-engineered crops do: they are not consumed, rarely produce seed, and do not re-grow vegetatively, so the risk of the plant or the genes spreading beyond human control is considered by many regulatory agencies to be small. This has helped make it possible for Florigene to introduce its blue flowers without much public debate. Georg Tremmel and Shiho Fukuhara think ‘Moondust’ carnations should become part of the public dialogue about transgenic plants. In a project titled “Common Flowers/White Out” (also see Common Flowers/White Out project), Tremmel and Fukuhara experiment with turning a purple carnation back to white by genetically-modifying the Florigene flower to its original white-flowered form. This work was featured at the Ars Electronica Centre in 2013, but I have not been able to find out if Tremmel and Fukuhara were successful with their reverse-engineering. I’m a florist and love to use these because there often aren’t other flowers with the right color. I’m a florist as well, and abhor the dyed varieties, but never thought how this one was produced. Thanks for the information, fascinating. I’m always bemused by the genetic engineering of plants so as to produce colours not found in nature. There are plenty of blue flowers around, indeed nature’s palette is pretty all-embracing, so why do we want blue carnations or roses, pink daffodils, etc.? IMHO, one might as well use artificial flowers to get ‘unnatural’ colours in cut flowers. I’m just relieved that it seems unlikely that the gene pool is not very likely to be contaminated by these cultivars. Very interesting article. I would buy them if I could. As to why people want to have flowers of an odd color (blue roses and carnations for example) it is a challenge and man/woman always likes a challenge. Can’t think of any familiar blue flowers that smell like carnations. Genetic engineering is little different than breeding – why select for any characteristics at all? Our gardens are works of art to some degree, and the very design of a garden itself is unnatural. Simple vegetable beds have a practical purpose, but so does the creation of beauty. The consequences of genetic modifications escaping into the wild are always a consideration, of course, especially with products from certain companies who do not seem to be constrained at all by worries of poisoning the commons. But surely this is really little different from the purchase and distribution of invasive species? I worked in a garden center for many years and have watched things change. There are now many flowers I feel are overly cultivated. We used to laugh at some of them saying, we are waiting for a polka dot variety, it has gotten that bad. Now we are finding specialty garden centers who offer us the “wild” or “natural” flowers we still love. Give me the plain old Ratibida any day. Those dyed carnations and orchids are hideous, such phony and unnatural shades. A saying you see about computer generated graphics works here: Just because you can doesn’t mean you should. independentsciencenews.org/health/hidden-…so we are against it and so are a lot of menbers of EU parlement.